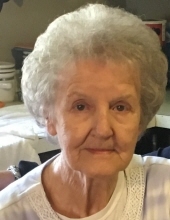 Helen Jones, age 83, of Hazard, KY passed away on April 10, 2019 at the Greg and Noreen Wells Hospice Care Center. Helen was a homemaker and a member of the Blair Memorial Baptist Church. She was born in Leslie County, on January 21, 1936 to the late Monroe Napier and the late Lucy Jones Napier. She is also preceded in death by her husband: Carl Jones, three sisters: Orpha, Mary Lou & Isabella; four brothers: Loy, Charlie, Walter & Darrell and one son-in-law: Mike Thompson. Funeral will be at 1PM Sat. April 13, 2019 at the Blair Memorial Baptist Church with Joseph Engle & Emmitt Campbell officiating. To send flowers or a remembrance gift to the family of Helen Jones, please visit our Tribute Store. "Email Address" would like to share the life celebration of Helen Jones. Click on the "link" to go to share a favorite memory or leave a condolence message for the family.